Very many years ago I had read a book considered by many as a classic in technology marketing – “Crossing the Chasm – by Geoffrey Moore”. It describes the challenges faced by technology marketers, most of whom, at some point, have to sell a product or service that has definite value that will change its market, but is at a price early on which doesn’t make sense given the state of the market. Moore presented a theory of the technology adoption life cycle and how people with different mindsets buy technology products at different stages of their life cycle for different reasons. “As the revised edition of this book is being written, it is 1998, and for this time we have seen a commercial release of the electric car. General Motors makes one, and Ford and Chrysler are sure to follow. Let’s assume the cars work like any other, except they are quieter and better for the environment. Now the question is: When are you going to buy one? Most successful technology products sell to the early adopters and makes it easy for the early majority to buy them early. Later they make it imperative for the late majority and the laggards to g et on board too. 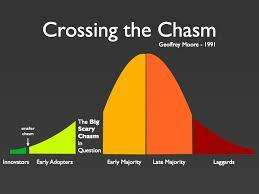 Between the early adopters and the early majority is the scary chasm to cross. Technology products and services, many of which are ‘disruptive innovations’ become truly successful when they cross that chasm. As India goes to the elections next month, the voter is faced with choices spread across the spectrum of old age decadence to new age disruption. On the one hand is an aging product losing market share and voter credibility with little signs of revival by a confused young leadership (represented by the Congress led by Rahul). Then there is a product of some credibility in a me-too company, promising past established benefits to a larger geography (represented by Modi in an old-world, factional BJP). And the new choice is what could potentially be called a disruptive innovation that promises the value of market-changing idealism but no one is sure at what price (represented by Kejriwal and his haphazard medley of AAP). The disruption of the kind represented by AAP, while often promising value, is not accepted well by the Indian establishment, and perhaps, also not by the Indian voter – specially because of the perceived fear of the price one pays for disruption. This is true of the Indian technology buyer too – something that most technology marketers in India know. Most products face a wide chasm before they become truly accepted. On similar lines, this reality of the Indian voter is what most politicians in India know. And it is due to this reality, that it is easy for established companies (and established political parties) to cloud the perception of a new disruptive innovator with more of disruption and less of innovation. The disruptive innovator’s DNA makes it easy to do so too. The parallels in the AAP and technology marketing don’t end there. Most disruptive innovations need early adopters to tolerate some early failures (even disasters) for the pride of being an early adopter. In the early life cycle, innovative products fail unexpectedly, or can’t provide service, or are inconvenient or downright embarrassing to own sometimes. Early adopters generally don’t perceive those risks because they see the benefits of market changing value that the disruptive innovator promises. But the early majority doesn’t – and hence the chasm. The AAP and the criticism it received for the 49 days of governance in Delhi is an example of how disruptive innovations can dismay even the staunchest of early adopters. Despite that, many early adopter voters are prepared to support it for the innovation of honest politics that it promises. But many early majority voters are also willing to settle for Modi’s promise of development and governance, without any major impact of corruption, due to the fear of the price of disruption. Most disruptive innovations also need the early majority and the late majority to adopt it to become truly successful. It looks like the AAP, at the current time, like many disruptive innovations, is stuck in the chasm currently between early adopters and the early majority. But there are no hard figures to prove or disprove the same. May be it has crossed the chasm if you believe their staunchest supporters, may be it is stuck there for ever, if you listen to their biggest detractors. Like most disruptive innovations, unless the results are out, one can never be sure. While the Modi-led NDA’s ascent and the Grand Old Party’s decadence seem to be the ‘givens’, where in the life cycle the AAP lies is perhaps the biggest ‘unknown’ in these elections – an unknown that can surprise either way, like most disruptive innovations. The next few weeks will determine what is contemporary India’s Tryst with Destiny.